Chinese Defense Ministry accused Washington of militarization of the South China Sea region, following sailing of an US Navy destroyer near the disputed Spratly Islands chain. BEIJING (Sputnik) — Earlier in the day, media reported that the USS Dewey sailed within 20 kilometers (12 miles) of Mischief Reef, in the Spratly Island chain. Chinese frigates tracked it and issued a warning, urging the vessel to leave the area. "China expresses strong protest and has already made representation to the US side in connection with such a demonstration of military force, boost to the militarization of the region and actions that can easily lead to incidents at sea and in the air," ministry's representative Ren Guoqiang said. Ren pointed out that the US vessel entered waters of the disputed archipelago, which China claims sovereignty of, without permission. China and several countries in the region, namely Japan, Vietnam and the Philippines, have disputes on maritime borders and responsibility areas in the South China and East China seas. In January 2013, the Philippines formally initiated arbitration proceedings against China's claim on the Spratly Islands, also known as the Nansha Islands, with the the Permanent Court of Arbitration ruling out in 2016 that the islands were not an exclusive economic zone for China. However, China refused to recognize the tribunal's ruling. 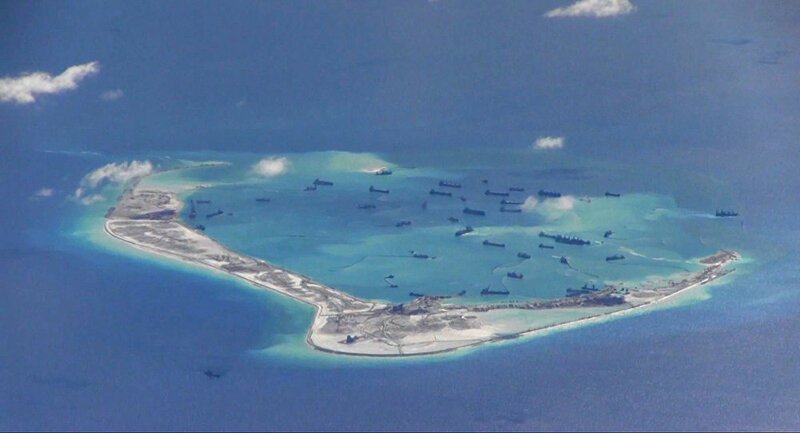 In late March, US-based Asia Maritime Transparency Initiative (AMTI) think tank said that Beijing had almost completed the construction of military and dual-use facilities on the disputed Spratly Islands.